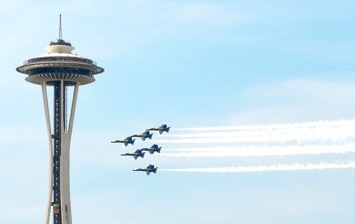 Each year the PNBAA community enjoys a friends and family barbecue luncheon on Boeing Field in advance of the Seafair Weekend Festival. The 2017 organizing committee has improved the recipe! Plan on tasting a gourmet catered barbecue lunch, smelling a whiff of the Blue Angels afterburner, potentially hearing our local former Blue Angel Craig Olson present and visiting with our generous sponsors Honeywell, Jetstream Aviation with ice cream and host team at Clay Lacy Aviation. Online registration is FREE. The organizing committee requests your help finalizing a catering plan, register by Tuesday, August 1st. If you are not a PNBAA member, consider joining 300+ of your peers now in strengthening this regional business aviation community and our future with youth and vocational scholarships.